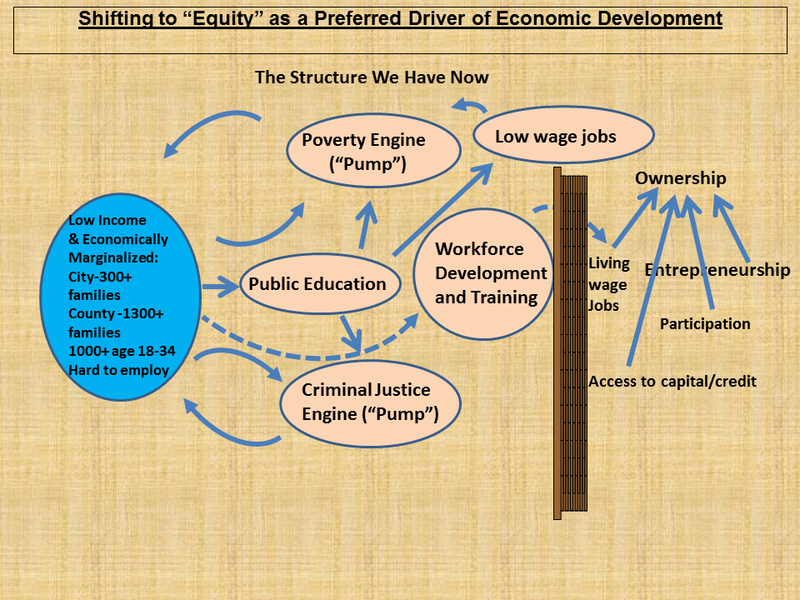 Kirby Edmonds has been helping many of us better understand how existing structures and associated services maintain current conditions, resulting in some people and families becoming chronically trapped within poverty and criminal justice cycles or bubbles (illustrated in image below), in spite of many good intentions and efforts like workforce training. The recent Understand to Overcome film screenings and discussions have provided some valuable insights into how racial perceptions can contribute to these structural barriers. Episode three of the series, The House We Live In, reveals how institutions and policies can disproportionately and unfairly channel resources, power, status and wealth. 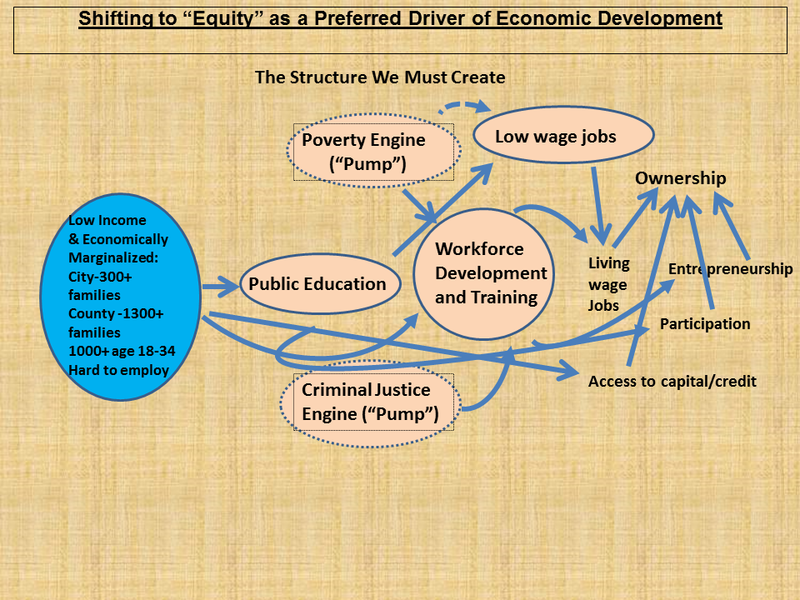 The image below illustrates some of the linkages which might be created or strengthened to move us toward the Building Bridges vision, and those which must be broken. Here many are now able to enter the “ownership economy” and all that entails, including access to property, capital, community/civic engagement, and greater control over one’s own economic destiny and well-being. There is no one entity whose job it is to create a new structure, and a lot of entities whose job it is to maintain what we have. We have not decided as a community to create a new structure. Old habits of mind and behavior. Our current relationships across race, class and place. Thankfully, a number of area initiatives like Better Housing for Tompkins County’s Home Ownership program are helping level this playing field, opening a door to ownership for many formerly excluded. Perhaps you know of other efforts, possibly even personally affected by those? Or you have a suggestion regarding what new structures might be created to support a more healthy, equitable and resilient community? Comments are welcomed below. In future Reimagining Our Infrastructure posts, I’ll explore other examples and potential approaches for supporting the Building Bridges vision, including ways we might better align and coordinate existing efforts for economic equity and environmental sustainability. This entry was posted in Economic Development, Equity, Infrastructure and tagged Reimagining Our Infrastructure. Bookmark the permalink. It would help me if the “new structure” diagram were clearer than the “existing structure” diagram. I’ll take a stab at it but others might too. And I’m happy to do a biz model workshop for entrepreneurial types who are in the “low income” bracket. I don’t know about biz loans though. Would need a partner there. I know in Rochester, NY there’s Progressive Federal Credit Union that grants loans to people who don’t qualify with status quo lenders. Thanks for your comment and offer. We’ll share it. Actually, we have a much clearer version of the diagrams in an animated powerpoint with narration. As soon as we can get it uploaded, it will be available here. Greetings Bridge Builders of Tompkins County. In my role as the Coordinator of Cornell Cooperative Extension’ Tompkins – Whole Community Project , I would like to take this opportunity to highlight some of the exciting happenings in Tompkins County. While it is practically impossible to capture and give kudos to all the good work , The Whole Community Project , acknowledges the great value in promoting and supporting each other in the creating of a sustainable local and regional food system. The link below is an interview with Mr. Jhakeem Haltom and Mr. Kenny ( True ) Benton at this past Friday’s Congo Square Market. Haltom, the founder of CSM and I have worked closely since CSM launched over 4 years ago, and Benton is a local business owner, father and rooted in his commitment to the future for our youth. Recently, Jhakeem, True and I began meeting as the start of a CSM Vendor Association. The concept is rooted in our commitment and experience professionally as entrepreneurs and local residents. Join us at the Congo Square Market, this Friday from 4:00pm-8:00pm at the Southside Community Center.